I will not be posting for a few weeks; however, will be back at it after my return from Europe. This is the fruit and a few of the vegetables that I picked up today and it will all be gone by Thursday. I hate to think how much fruit and vegetables we will go through when the kids are older. Today we will talk a little about Mango. I never liked Mango until I was pregnant with my son, for some reason my heart would miss a beat just at the smell of Mango, I jus tcould not get enough and when I found out that for every mango I got 4 grams of fiber I was sold. I am happy to say that the love for the fruit that I developed while pregnant has stayed with me, and I get a few every week. Mangoes help combat cancer it boosts memory, regulates the thyroidaid and digestion and helps shield against Alzheimer's. One Mago has aproxametly 135 calories, > 1g of fat, 4mg of sodium, 323mg of potassium, 35 carbs, 3.7g fiber, 31g sugar, and 1g protein. Mango also has a lot of vitamin C and lets not forget they taste good. This is the pizza that John Barricelli made the day that I visited the Martha Stewart Show. I figured since I did see him make it in person that I would try it at home. I hope that John doesn't let me down on this one. A little tidbit about this segment of the show, John poured the pepper into the dough and Martha started sneezing and coughing, they had to stop filming until she could get over it. In a medium bowl, sprinkle sugar and yeast over 1/4 cup warm water. Stir with a fork until sugar and yeast are dissolved. Let stand until foamy, about 5 minutes. Add remaining 1/2 cup warm water, along with oil, salt, flour, pepper, and rosemary. Using a wooden spoon, stir until dough forms. Transfer to a lightly floured work surface; knead until smooth, about 5 minutes. Place dough in a lightly oiled bowl, turning to coat. Cover with plastic wrap; let rise in a warm place until doubled in bulk, about 1 hour. Lightly oil a 17-by-12-inch rimmed baking sheet, and set aside. Roll out dough to a 17-by-12-inch rectangle, and fit into sheet, folding up the edges slightly to form a small lip. Prick dough all over with a fork. Cover with oiled plastic wrap, and let rise in a warm place until slightly puffed, about 30 minutes. Preheat oven to 450 degrees, with a rack in the center. Place potatoes in a medium bowl and drizzle with olive oil; season with salt and pepper. Distribute potato slices evenly over dough; sprinkle with rosemary and cheese. Transfer pizetta to oven and bake for 12 minutes. Rotate sheet, and continue baking until crust is golden, about 15 minutes more. Remove from oven; using a large spatula, transfer to a cutting board. Slice into pieces, and serve warm or at room temperature. Although the pizetta is best eaten the day it is baked, it can be reheated the next day; place in a 200 degree oven for 10 to 15 minutes until heated through. I found this pizetta to be a little dry so I drizzled it with olive oil and that was great. I also thought that the potato got a little lost in the crust so next time I plan to make the layers of potato thicker and add 2 T of rosemary to the top of the pizetta. it was wonderfully crisp. Here I am waiting in line out side of the studio to watch a recording of The Martha Stewart Show. After a while they let us on and we sat in a room for a while and then they come in and train us in all the Qs for mmmmmmmm, aaaaaaaa, ooooooooo and clapping. Then off the the studio where it was cold, not cool, but cold the camara men were wearing coats and Martha was late so we had to sit for a very long time in the cold. Now look at all those lights on the celing, with all of those you would think it would have been hot, not the case. It was really cool to see how a show is put together and I am happy to have been able to have a chance to see it but spending 4 hours to see this may have been a little much and I don't think I would do it again. The show aired on April 11th 2008 and you can see clips at marthastewart.com where John Barricelli makes a potato Pizetta. The Trip to NYC was a lot of fun. I watched the filming for the Martha Stewart show that is airing tomorrow, April 11th. I was in the mood for pie the other day so I pulled out some rhubarb that I had in the freeze and I had some other frozen berries such as strawberries and I whipped up a glaze pie. I used my huckleberry pie recipe and a new crust recipe, because I am always looking for that perfect crust and have not found it yet, and I may never. This one was ok, but I think that it would have been better with a cream or chocolate based pie and not a fruit pie. I put the flour, butter and sugar in a food processor and pulsed it a few time to break up the butter. add the egg vanilla and water and pulse a few more times to bring together. Remove the dough from the processor onto some plastic wrap and wrap tightlyand place the dough in the refrigeratorfor at least 20 minutes. roll out dough on a floured surface until it is large enough for a 9" pie pan. place the dough into the pan, crimp edges as desired. prick bottom with a for and blind bake in the at 400F for 10 minutes or until golden. fill with prepared pie filling and chill. I try very hard to get 25 or more grams of fiber into my diet every day. Some days I fall short but for the most part I get my fiber. People often ask how I do it and some have even suggested blogging about the subject. Blog about fiber? Who really wants to read about fiber, but as time goes on more and more people ask how I do it. So, here it is, High Fiber Friday. Okay, okay who really wants to eat healthy and high fiber meals on Friday, but it sounds better than high fiber Tuesday. I don't plan to give a daily menu that will add up to 25 grams of fiber but just give some tips, hits, ideas and finds that help increase fiber intake. Some things taste high in fiber and some not so much but it gets the fiber count up. For My first High Fiber trick I introduce Mission 10" carb balance tortilla. These are not very great for quesadilla because they don't toast up very and as burrito wraps they are, well a little wheaty. However, at 21 grams of fiber per tortilla, I was bound and determined to find a way to enjoy them. 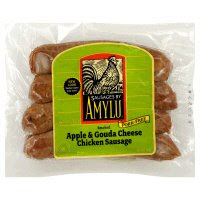 I found that the wheaty flavor worked very nice with Apple Gouda chicken sausages, mango peach salsa, Dijon mustard, avocado and some onions. 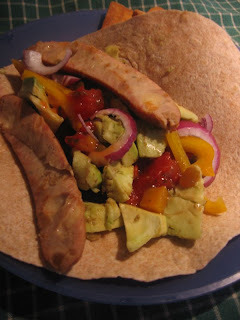 Heat the sausage, place it, 1/4 cup salsa, mustard, 1/4 of an avocado and onion in the tortilla and wrap. coming in at 400 calories, 43g carbs, 26g Fiber, 13g protein and 16g fat this is a lunch you can feel good about. And yes I will use these tortillas for burritos and quesadilla too.